Working on a story? Have an idea you wish to pursue? We sincerely appreciate your interest in Capilano Suspension Bridge Park and we are looking forward to assisting you with your travel or news stories. Whether you need high-resolution images, b-roll, or detailed information, we are available to assist and look forward to hearing from you! Please click on the Digital Assets Login to request a username and password. Due to the large volume of media visit inquiries, we are unable to accommodate last minute, in-person media pass requests. We are also unable to provide complimentary tickets to media on vacation who are not intending to write about their visit with us. Media passes are limited during our peak periods, as our guest experience is very important to us. For safety reasons, recreational drone use by any guest or member of the public, for any reason, is not permitted on or over any our property. Likewise, commercial use is also prohibited on Capilano Suspension Bridge Park property, except in limited circumstances. Please contact us for more details. 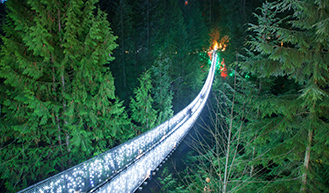 Canyon Lights at Capilano Suspension Bridge Park rings in the holiday season with a brand new twinkling feature! North Vancouver, BC – Canyon Lights at Capilano Suspension Bridge Park opens for the 2016 holiday season on Thursday, November 24th. Get into the spirit of the season and be amazed by the hundreds of thousands of lights throughout the park that keep both local residents and visitors from all over the world returning, year after year. A family favourite holiday tradition, Canyon Lights is excited to unveil a brand new light feature this year. ‘Fireflies’ is an interactive lighting display in the rainforest, ONLY at Capilano. Using magic flashlights, guests can awaken waves of tiny lights that glimmer and twinkle like fireflies. The suspension bridge, Treetops Adventure, Cliffwalk, the rainforest and canyon will be transformed into a world of festive lights and dazzling visual enchantment. Lights will illuminate Capilano River and the canyon’s cliff face. See the world’s tallest living Christmas tree (153 feet tall and growing!) and search for the glowing owls in the Snowy Owl Prowl. The holiday fun doesn’t stop there! Visitors are invited to sing-along to carols with the holiday band, decorate gingerbread cookies, make Christmas crafts and take family photos throughout the park. Ronald McDonald House, BC Professional Fire Fighters’ Burn Fund, Family Services of the North Shore, Harvest Project, Special Olympics BC, Lions Gate Hospital Foundation, Big Brothers and Big Sisters of the Lower Mainland and Kids Up Front. Canyon Lights runs Thursday, November 24, 2016 to Sunday, January 8, 2017. Park hours are 11:00am – 9:00pm. Canyon Lights tickets are valid all day with holiday activities beginning at 4:00pm. Capilano operates a free shuttle to and from Canada Place. For general information, including the shuttle schedule, please visit www.capbridge.com or call 604.985.7474. For information on the BC Professional Fire Fighters’ Burn Fund, please visit www.burnfund.org. Canyon Lights Now Takes Flight! Canyon Lights at Capilano Suspension Bridge Park glows with a new light feature! North Vancouver, BC – On Thursday, November 24, 2016 Canyon Lights at Capilano Suspension Bridge Park opens for its 11th season. Re-capture the feeling of wonder and excitement of the holidays and be amazed by the hundreds of thousands of lights throughout the park that keep both local residents and visitors from all over the world returning, year after year. New this year is ‘Fireflies’, an interactive lighting display in the rainforest, ONLY at Capilano. Using giant flashlights, guests can magically awaken waves of tiny lights that glimmer and twinkle like fireflies. The suspension bridge, Treetops Adventure, Cliffwalk, the rainforest and canyon will again be transformed into a glistening world of festive lights and dazzling visual enchantment. Lights will illuminate Capilano River and the canyon’s cliff face. See the world’s tallest living Christmas tree (153 feet tall and growing!) and search for the glowing owls in the Snowy Owl Prowl. Sing-along with the holiday band. Decorate gingerbread cookies, make Christmas crafts and take family photos throughout the park. Canyon Lights will donate partial proceeds from admissions to the BC Professional Fire Fighters’ Burn Fund for fire and burn education in schools throughout British Columbia. To date, Canyon Lights has donated over $222,000 for this worthy program. Raptors Ridge Birds of Prey return to a brand new space at Capilano Suspension Bridge Park! North Vancouver, B.C. – Raptors Ridge have flown their old coop to a brand new facility at Capilano Suspension Bridge Park this summer. Everyday from June 18th to September 5th – 10am to 6pm, the engaging and friendly bird handlers will be answering all your bird related questions at a bigger, brighter space in the heart of the rainforest at Capilano Suspension Bridge Park. Get an up close connection with Red-Tailed Hawks, Lanner Falcons and Great Horned Owls in their natural West Coast habitat – it’s a hoot! Raptors Ridge is just one more amazing experience to top off your visit to Capilano Suspension Bridge Park. These seasonal events are one of the great reasons BC residents return to the park all throughout the year. For the price of one day’s admission, BC residents are eligible for a Capilano Suspension Bridge Park annual pass. The pass is valid for unlimited admission for one full year from the date of purchase and entitles members to a variety of benefits including discounts and access to special events, like Canyon Lights! Cross its world famous 450 foot span, get your heart racing on Cliffwalk, stroll the rainforest canopy on Treetops Adventure, take a guided rainforest tour, enjoy seasonal entertainment, discover viewpoints, trout ponds and so much more, all included with your day’s admission. A free shuttle service is offered from downtown Vancouver with service every 10 – 15 minutes during the day. Visit www.capbridge.com or call 604-985-7474 for more information. Capilano Suspension Bridge Park is located at 3735 Capilano Road, North Vancouver. Capilano Suspension Bridge Park is part of the Capilano Group, which comprises retail, hospitality and tourism based businesses including Moraine Lake Lodge and Cathedral Mountain Lodge located near Banff, AB, as well as Stanley Park Pavilion and Prospect Point in Stanley Park, Vancouver, BC. Make room Santa Claus! Canyon Lights is coming to town! Vancouver’s family holiday tradition returns for its 10th season! North Vancouver, BC – This Friday, November 27, 2015 Canyon Lights at Capilano Suspension Bridge Park opens for its tenth season. Canyon Lights is proud to be a finalist in the 2015 Canadian Tourism Awards for the Event of the Year. The suspension bridge, Treetops Adventure, Cliffwalk and the rainforest transform into a world of festive lights and visual enchantment. New this year – create your own light show with VocaLites, a voice activated interactive light display in the rainforest. Lights illuminate the canyon’s cliff face and Capilano River below. See the world’s tallest living Christmas tree (153 feet tall and still growing!). Go on a kids scavenger hunt, sing-along with the holiday band, decorate gingerbread cookies, create your own Christmas card and take your family holiday photo in the Winter Pavilion. Partial proceeds from Canyon Lights ticket sales will be donated to the BC Professional Fire Fighters’ Burn Fund for fire and burn education in BC schools. To date, Canyon Lights has raised over $192,000 for this worthy program. In addition, Capilano Suspension Bridge Park will continue hosting 12 community nights for local charities including Special Olympics BC, Big Brothers and Big Sisters, North Shore Neighbourhood House, Kids Up Front, Canuck Place, Easter Seals, Ronald McDonald House, Family Services of the North Shore, Harvest Project, Lions Gate Hospital Foundation, Covenant House and North Shore Disability Resource Centre. Canyon Lights runs Friday, November 27, 2015 to Sunday, January 3, 2016, except on Christmas Day when the park is closed. Park hours are 11:00am – 9:00pm. Canyon Lights tickets are valid all day with holiday activities beginning at 4:00pm. Capilano operates a free shuttle to and from Canada Place. For general information, including the shuttle schedule, please visit www.capbridge.com or call 604.985.7474. For information on the BC Professional Fire Fighters’ Burn Fund, please visit www.burnfund.org. Capilano Suspension Bridge Park is located in North Vancouver at 3735 Capilano Road. Canyon Lights at Capilano Suspension Bridge Park – Vancouver’s family holiday tradition! 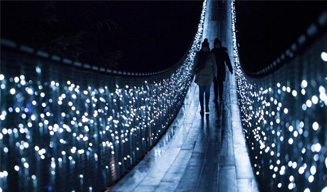 North Vancouver, BC – On Friday, November 27, 2015 Canyon Lights at Capilano Suspension Bridge Park opens for its tenth season. The suspension bridge, Treetops Adventure, Cliffwalk and the rainforest will transform into a world of festive lights and visual enchantment. New this year – create your own light show with VocaLites, a voice activated interactive light display in the rainforest. Lights will illuminate Capilano River and the canyon’s cliff face. See the world’s tallest living Christmas tree (153 feet tall and still growing!) and go on a kids scavenger hunt throughout the park. Sing-along with the holiday band, decorate gingerbread cookies, create your own Christmas card and take your family photo in the Winter Pavilion. Partial proceeds from Canyon Lights ticket sales will be donated to the BC Professional Fire Fighters’ Burn Fund for fire and burn education in BC schools. To date, Canyon Lights has donated over $192,000 for this worthy program. Canyon Lights runs Friday, November 27, 2015 to Sunday, January 3, 2016. Park hours are 11:00am – 9:00pm. Canyon Lights tickets are valid all day with holiday activities beginning at 4:00pm. Capilano operates a free shuttle to and from Canada Place. to request a username and password. Please include your intended usage. from the email account from which you first applied. If you have changed companies, you must re-apply for a new username and password.